In the actual Fate Route (after Saber is summoned) we see Gilgamesh in casual attire when he confronts Saber and Shirou before getting into his golden armour. However, in Unlimited Blade Works and before the start of the Fate Route, his casual attire is different, particularly his hair and that he's not wearing earrings. Now I can understand that in Unlimited Blade Works the reason he doesn't wear his armour when fighting Shirou in the end is in part due to his ego in thinking he won't need it on someone like Shirou. However, I don't think it's his ego which is the cause of his change in appearance. So I am wondering, why does Gilgamesh's casual appearance look different in these two routes, considering his Unlimited Blade Works appearance was also seen when he was talking to Sakura? I never play Fate/stay night until the end but know a little, I think it's more like "he has anything in his vault and willing to wear casual clothes, so let's make him stylish" sort kind of thing. Because as I know, other servants don't even wear "normal casual" clothes as much as Gilgamesh, they pretty much always use their astral dress/clothes which is very(?) strong/sturdy (in the case with Saber's dress that can block certain magical attacks). As for the reason why Gilgamesh wear casual clothes much, I think it's to emphasize his arrogance, I mean he is a king and think himself the most powerful entity in their universe, and mostly because he is ranged-type because most of the time he just throw whatever in his vault, even his strongest weapon Ea isn't melee-type weapon like Lancer's noble phantasm Gae Bolg: barbed spear that pierces with death or even Caster's Rule Breaker or Assassin's Tsubame Gaeshi. From a real-world perspective, my guess is just that they wanted to give him a few different looks, instead of making him look identical in every scene. He likes to wear casual clothes, "playing attire" to ward off boredom from being in spirit form, when not in battle, later becoming knowledgeable on the latest fashion trends after living in modern society for ten years. He has collected a number of casual outfits. Fate/Zero: The clothing he wears in during the Fourth Holy Grail War is a fashionable white v-neck with three quarter sleeves, and python print pants. 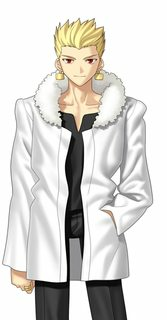 Fate route: During Fate, he wears a white jacket with a fur collar, a black shirt, and black pants. Biker outfit: The "biker outfit" worn at the beginning of the game and in the Unlimited Blade Works route and Heaven's Feel route is his favorite outfit, liking it enough to ignore Shirou's group when presented with the possibility of the ashes from the burning Einzbern Castle dirtying it. It can be said Shirou's life is worth less to him than his coat. He dons this clothing in the first Fate/stay night Manga adaptation of both the Fate route and Unlimited Blade Works route. Perhaps because he has been living in human society for the past ten years, he seems to be hip on the latest fashions. He owns various casual clothes, but his favorite is the biker outfit he wore in the Rin route. Also, during the design stage, I selfishly insisted that "Gil absolutely has to wear full golden plate armor". Why do the summoned Servants all belong to different classes? Why do red Saber and blue Saber look so alike? Did Gilgamesh know about Sakura? Why is King Arthur female? Why is Iskander tall? What happens if there is no relic in a summoning? What caused the difference between the good and true endings of Unlimited Blade Works?